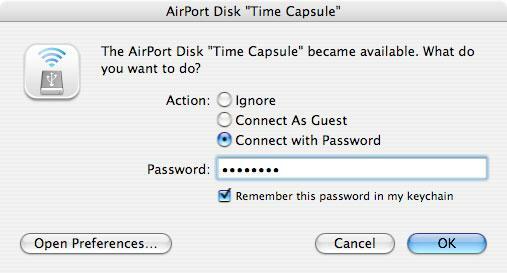 Time Capsule moves Apple's popular AirPort line of wireless base stations one step closer into the realm of embedded servers, providing shared file and print services in addition to acting as a target for Leopard's Time Machine feature. Here's a look at how it works with Leopard, Tiger and Windows clients, and what components are inside the device making everything happen. 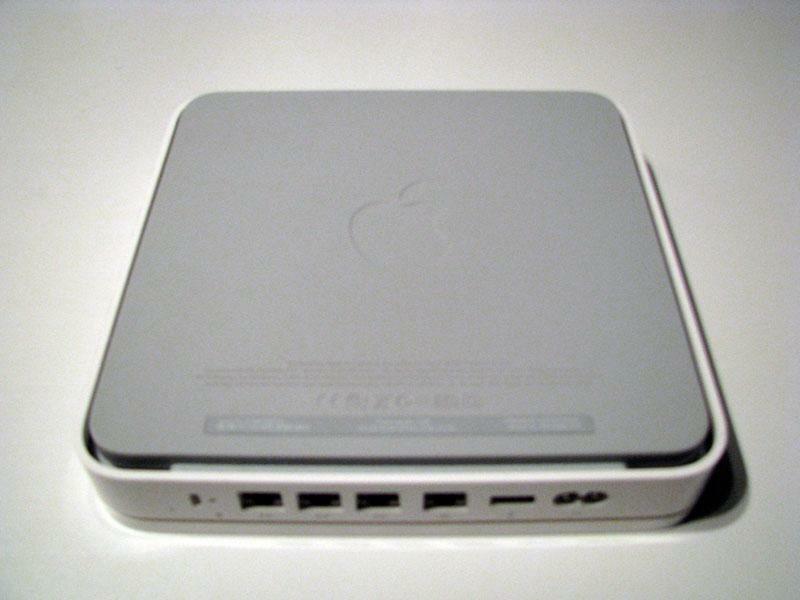 Time Capsule's features are nearly identical to the existing Airport Extreme introduced last January, which we detailed in An in-depth review of Apple's 802.11n AirPort Extreme Base Station. In August, Apple upgraded the Extreme to use Gigabit Ethernet ports; Time Capsule also supplies Gigabit Ethernet ports for both WAN and LAN users. Time Capsule is also slightly larger, allowing it to include a full size 3.5" hard drive in either a half of full terabyte (1024 GB) storage capacity, as well as having its 30 watt power adapter included inside the device rather than shipping as an external power brick like the Extreme. 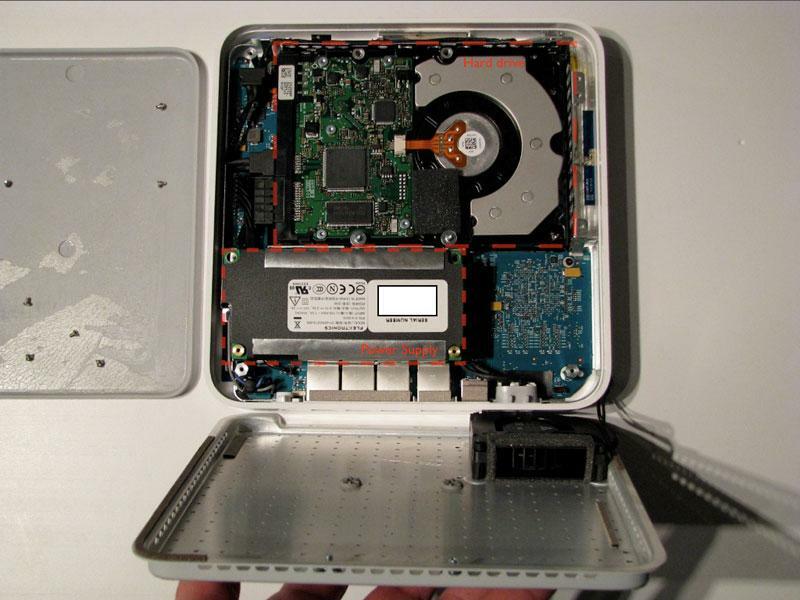 Once configured, as described in Apple Time Capsule unboxing and preview, the unit serves up its internal hard drive as a shared disk. 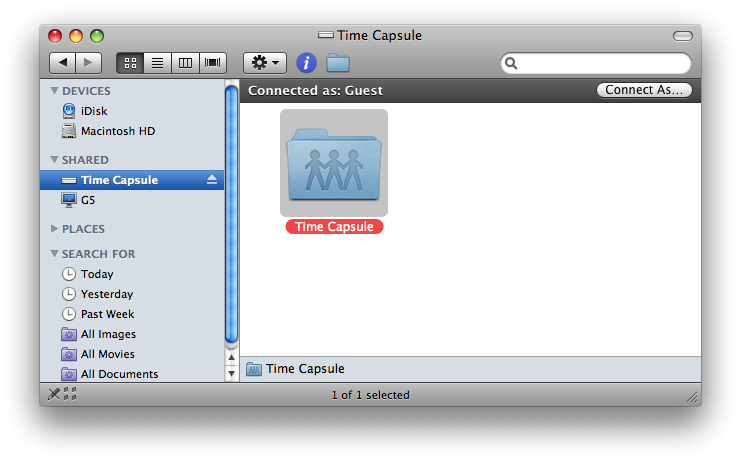 Leopard users will immediately see the shared Time Capsule volume in their Bonjour-discovered list of Shared items in the Finder (below). Tiger users will need to use AirPort Disk Utility to login and connect to the shared disks on Time Capsule or an AirPort Extreme (below top), which will then show up in the Tiger Finder as a mounted drive (below bottom). AirPort Disk Utility is also used in Tiger to set the preferred behaviors for automatically logging into and mounting the volumes when they become available on the network (below). These features have been replaced by Leopard's smarter Finder, which both browses for shared drives automatically and presents options to login as a guest or specific user. 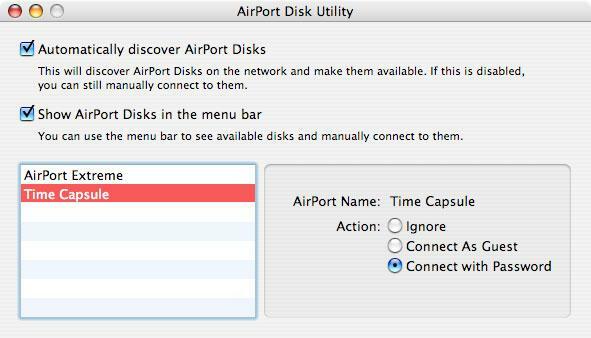 The utility's options to "Automatically discover AirPort Disks" and "Show AirPort Disks in the menu bar" are therefore now ignored under Leopard. 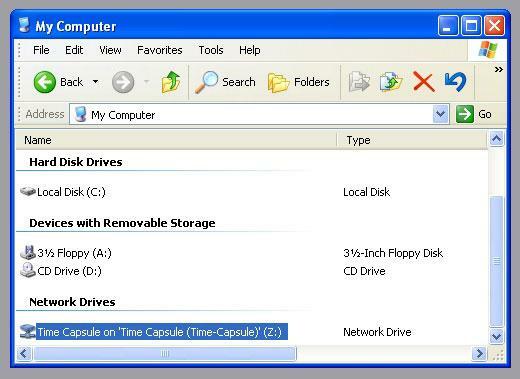 Windows users get the similar AirPort Disk Utility (below top) to discover shared disks being served from a Time Capsule or Extreme, and the shared volumes are mounted in the Windows Explorer (below bottom) as network drives. 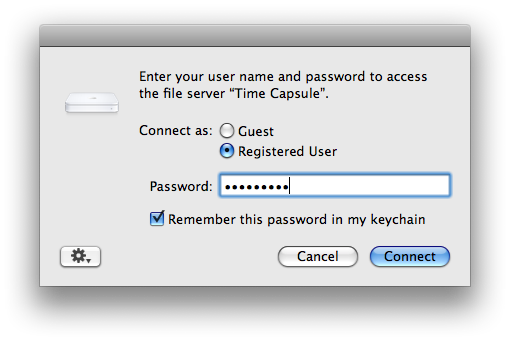 Time Capsule, just like the AirPort Extreme, shares the same volume to both Mac and Windows users, making it an easy way to share files cross platform without requiring any file server expertise. There's no directory server to manage and no complex file permissions to set up. 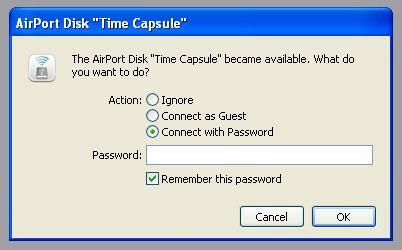 Time Capsule presents a single volume as a single share with one set of permissions per user. There are no fancy options to provide specific users with access to certain folder or files; in order to do that (such as reserving access to accounting files), users would either need to save those files within an encrypted disk image or spring for a more complex server solution, such as using Leopard Server running on a standalone computer. 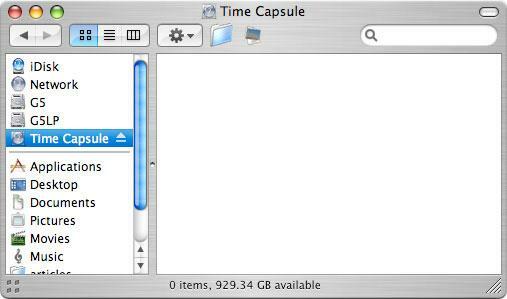 For home users and small businesses with basic needs, Time Capsule (and the identical Extreme) provides a low cost, low maintenance, and extremely simple solution for providing centralized file sharing. In addition, both units can also be expanded via USB to share a standard printer and additional volumes on other external USB hard drives, using a USB hub if necessary. As with other wireless printer sharing options, plugging a shared printer into the Time Capsule's USB port for shared use, instead of plugging the printer directly into a computer, may limit the features available on the printer, as some printers require direct USB access to perform activities such as cleaning the print heads. 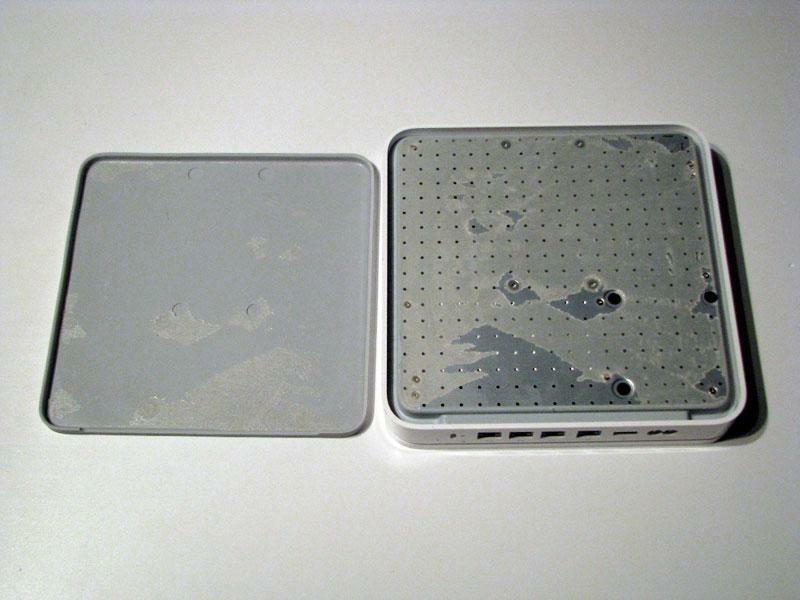 The bottom of the Time Capsule uses the same rubbery non-stick cover as the Extreme and Apple TV. 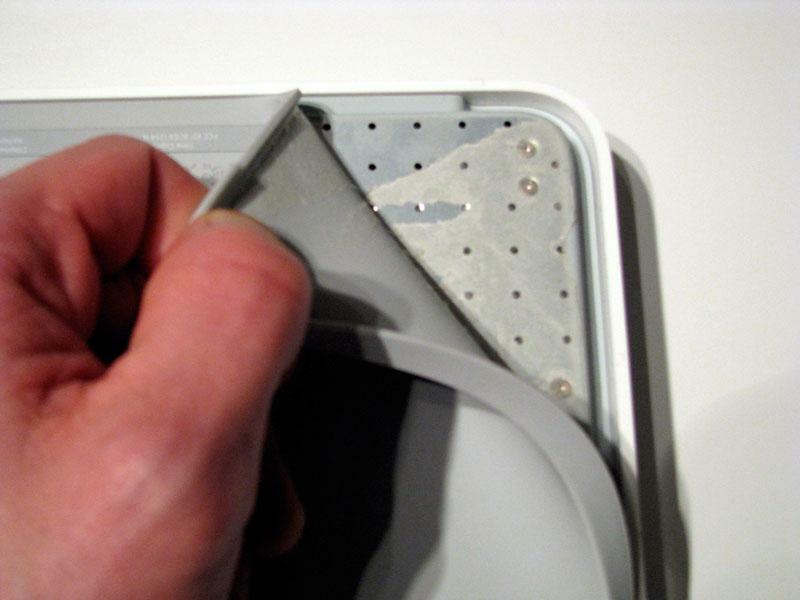 To open the unit, the rubber must be peeled off (below). Enough glue remains on the metal surface to allow the rubber to stick back into place afterward, as long as some care is taken to prevent the sticky surface from being cleaned off or contaminated. After removing ten standard Phillips #0 screws, the metal plate lifts off. The unit's fan remains attached to the metal cover, and has a power cord that plugs into the logic board (below). Also clearly visible are the hard drive and the 30 watt Flextronics power supply, which directly plugs into both the logic board and the hard drive. On page 2 of 2: Teardown continued; and Time Capsule uses.